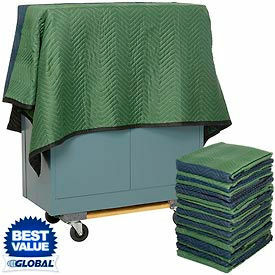 Protective Moving Pad Blankets provide Maximum Shipment Protection. Use these Moving Pads to help absorb shock and prevent chips and scratches when transporting items. Pads are constructed of high quality materials for long lasting durability and dependability. Full insulation provides surface protection for furniture, electronics, fragile items and more. Dimensions are 72"L x 80"W. Color finishes vary per Brand. Sold in Package Quantities. 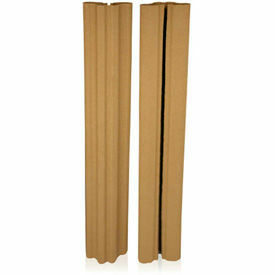 American Moving Supplies Door Jamb Protector Increases Efficiency and Reduces Damage during Moves. American Moving Supplies Door Jamb Protectors protect doors and furniture from scratches, dents and marring when moving through doorways or other entryways. 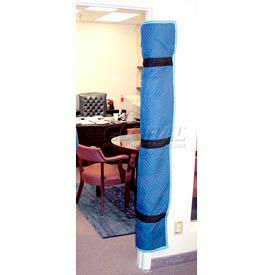 Door Jamb Protector is constructed of a padded blue upholstered fabric surface and 3 heavy-duty tempered springs with flared ends to safely and securely hold pad on the door frame. Padding around the springs is double insulated for durability and long life. Door Jamb Protectors can also be used on banisters on stairways and measures 55"L x 30"W.
American Moving Supplies Fitted Hand Truck Covers Protect Your Hand Truck and Cargo. American Moving Supplies Fitted Hand Truck Covers offer a padded blue upholstered fabric surface on both sides and are sewn with a tight zigzag lock-stitches for slip resistance. 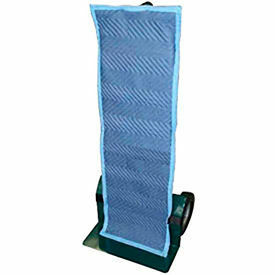 Hand Truck Cover fits most standard Hand Trucks and easily attaches using hook & loop straps. Measures 50"L x 16"W.
Appliance Truck Cover fits most standard Appliance Hand Trucks and easily attaches using hook & loop straps. Measures 58"L x 18"W.
Ram Board® Ram Jamb™ Door Jamb Protectors help Prevent Door Jamb Accidents that can Cost You Time & Money! Protecting Door Jambs has become an essential part of remodeling, moving, and new construction. Ram Board® Ram Jamb™ Door Jamb Protection is heavy-duty, flexible, and re-usable. Door Jamb Protectors install in seconds with no tape or adhesives required. Simply snap onto the Door Jambs to protect those Jambs from the dings, dents, and scratches that can occur during construction and remodeling jobs. Note: Fits 4" to 9" Door Jambs.